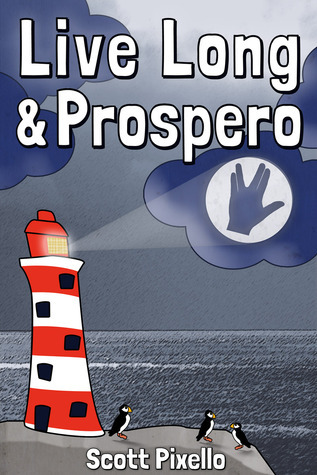 Today on the blog, I have an Author interview with Scott Pixello the author of Live Long and Prospero. 1983. The Grange Lighthouse, just off the western coast of the UK. Nearest human habitation- New York. Principal Lighthousekeeper James Church settles down to his usual breakfast of whisky and cornflakes. Not together. He has some standards- particularly low ones that he constantly fails to live up to. Into his well-ordered universe comes a scientist to study the nearby puffin colony. This leads Church, and his crew of social misfits, who are forced to share their Captain’s unhealthy obsession with Star Trek, on a strange journey featuring a nasty gang of drug dealers, a surprising undersea discovery and a hamster called Steve. This is a Young Adult novel with slightly more emphasis on the ‘Adult’ (14+) than previous books by Scott Pixello but not in the sense of being any more grown-up. Think The Tempest meets Star Trek. A: I’ve often thought of lighthouses as quite otherworldly kinds of places, like time capsules. They’re places which are often 100s of years old, set in landscape that is beautiful and scary in equal measure and where you have to live a completely self-contained lifestyle, cut off from the rest of the world. It’s a bit like being in space (funnily enough, one of my current other writing projects). I’m also interested in environments where characters can exert almost complete control to indulge their weirdest paranoid fantasies and then have that turned upside down when someone from outside disrupts the perfect equilibrium they have created. And I think puffins are cute too. inspiration? What's a book/author that changed your life? A: I come back to contemporary greats like Margaret Attwood and Salman Rushdie from time to time. They’re like the most luxurious food you can imagine. I still mark texts with a pencil from when I was at school and whenever I read really good, high-powered fiction, I’m marking almost every other sentence with some kind of note. Like rich food, I can’t consume this all the time and I like fast food too (this simile/metaphor’s running out of steam a bit) but you need a varied diet in all things- food, music & books too. That’s really what I object to about genre fiction. It’s like eating just one kind of vegetable- I’ve nothing against mushrooms but a diet of just that? No thanks. Books that changed my life? Not sure. A DJ maybe. A bit Old Skool for your readers? Individual books can give you something extra to chew on. I remember being wowed by George Eliot’s Middlemarch and not just coz George is female and the book itself weighs about as much as a small truck. I think it’s around chapter 11, you go to a dinner party with one character and during the conversation, you somehow hook up with another and leave with them. Neat stuff like that, I remember. Realizing in American Psycho that characters we’d ‘seen’ murdered, were still alive, i.e. that narrators can lie (ooh yes, I like that). That writers use incomplete or ungrammatical sentences that would make your teachers freak. It’s all good. Q: How long did it take you to write Live Long and Prospero? A: The version that I’ve published seems to have appeared very quickly but it went through a lot of different stages. It began life as a film script and still has some of that visual quality. The basic idea I wrote probably about three years ago but I wanted to “clever it up” so the layers about Star Trek, The Tempest, characters hiding and finding things- all that took quite a while. Q: If you had to pick one color to wear for the rest of your life, what would it be? A:Black- like my soul. My second book, Memoir of a Gothic Girl, is all about someone who turns to the dark side (but only culturally). I wear black most of the time, not as a fashion statement but because I’m a bit of a chubby geek who needs to blend in with the shadows so people don’t bump into me. Q: How much thought do you put into character names? Do you have a favorite character in Live Long and Prospero? A:Character names are important but I have to rein in my enthusiasm for symbolic names. Dickens can get away with it but if you give your character a cartoonish signifier of his/her character, it can work well at first but it makes it difficult for that character to change or develop. One character in Live Long & Prospero has a particularly important name but I don’t want to spoil the fun by saying which one. Favourite character? I quite like them all but probably Jake, the stammering 19-year-old who has a shrine to The Smiths in his room. Q: What are three words you would use to describe your book? Q: How have you come up with your titles? A:Titles are quite important and not just so people buy my books rather than other people’s. Luke, I am Your Father was quite easy- it’s about a childish 16-year-old with a Star Wars fixation who manages to get his girlfriend pregnant. There’s a lot more to that but that’s the starting point. It’s also perpetuating a misquote just to infuriate fanboys (and –girls) but that’s picked up at the end. I like to plant lots of little jokes and clues that come together at the end. I suppose I want my readers to work a bit but I do reward them for that. The title of Memoir of a Gothic Girl is also explained in the opening section of that book and concerns the worst Christmas present ever, the main character’s brother who has a strong lisp and a desire to express thoughts and feelings without getting in trouble all the time. Read the book and you’ll see what I mean. My latest book, Rainbow, is about a psychic cow and that’s the name of the animal in question. Couldn’t resist a symbolic name here and as you’ll see from the book (the opening chapter is included in Live Long & Prospero), it is justified and I felt it unlikely that a calf’s character would change radically through the course of a story. A:I had a really vicious hater on my tail for a book of non-fiction that I wrote under another name. Some of what she wrote was justified but a lot wasn’t and it pretty much killed off sales of that book that took me years to write. Indulging in online slanging matches however doesn’t work either. You just have to grin and bear it. I would say, I’d recommend ignoring negative reviews when there are less than 10 in total but it’s hard (especially when an author is relatively unknown and the book, as it was in this case, was relatively expensive). One of the real advantages of ebooks is the ability to set pricing so that you’re not making people pay huge prices when it’s the publishers who do that but with your name on the cover, you do get the blame. I’m trying to get into Goodreads a bit more- most of the people who’ve tried my stuff like it and with the way the Net works these days, while negative reviews get an unfair prominence sometimes, over time fan power can right most wrongs. Q: If you had to identify yourself using a well-known (or even unknown) quote what would it be? You can find the resat of the tour stops here.